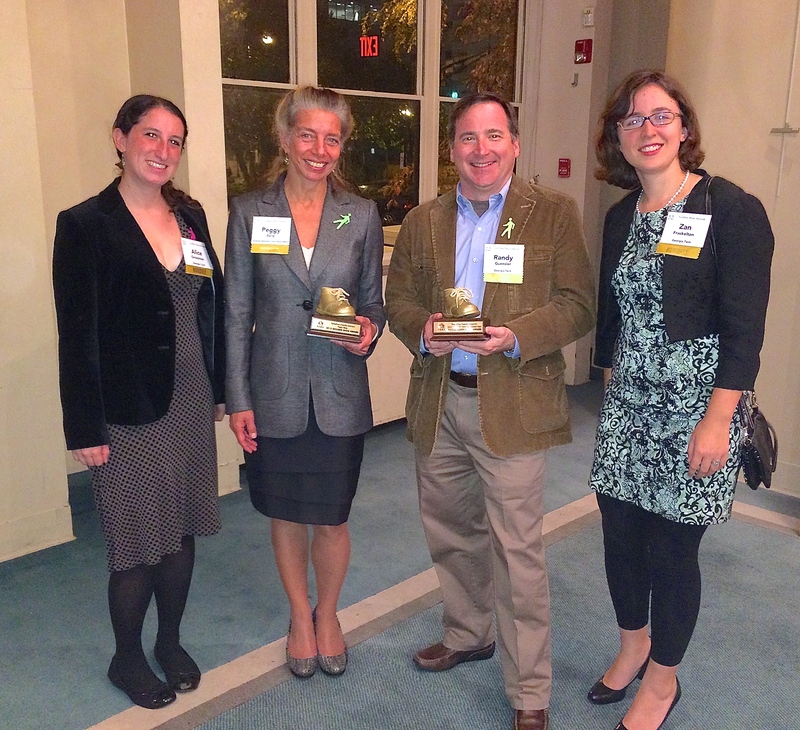 Peggy Berg and Randy Guensler: VaHi’s 2013 PEDS Golden Shoe Award Winners! 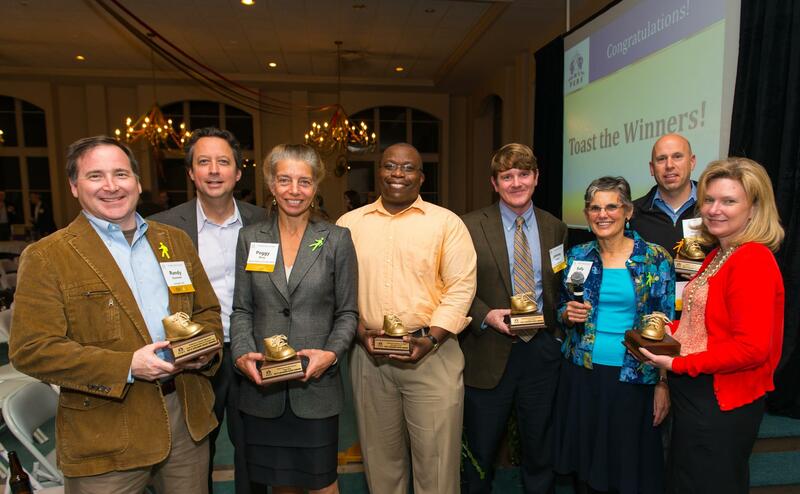 Congratulations to VaHi residents Peggy Berg and Randy Guensler who were named recipients of the 2013 Golden Shoe award from PEDS, the pedestrian advocacy organization. The pair was given their awards at a ceremony Thursday night at All Saints Church on West Peachtree Street. Berg won the award for Pedestian-friendly Activism. As safety/sidewalks chair for the VHCA Berg negotiated an arrangement with the city’s Public Works Department that resulted in the first large-scale repair of sidewalks in our neighborhood in 40 years. Ms. Berg took responsibility for all of the program’s considerable organizational challenges – securing partial matching funds from the neighborhood association, overseeing public outreach, answering every respondent, measuring and estimating the repair costs of each section, and submitting the collected funding and schematics to the city. Bundling sidewalk repairs in this manner was a win/win for both parties, enabling the Civic Association to promote a comprehensive approach to making sidewalk repairs on a large scale and the city to perform the work in a cost effective, efficient and timely manner. Click here to read more about this effort. Berg was also recognized for her participation in a city hall task force last year that took a hard look at the city’s policies and procedures for dealing with sidewalk maintenance, widely considered to be archaic and ineffective. The task force produced recommendations that will hopefully bring about improvements. Guensler received the award for Pedestrian-friendly Research for the comprehensive sidewalk inventory project he spearheaded through Georgia Tech’s Center for Traffic Operations and Safety. Guensler fitted a tablet device onto a wheelchair and programmed the rolling contraption to take video, measure cracks and bumps, and upload latitude and longitude coordinates to a mapping system. You can read more about Guensler’s sidewalk inventory mapping project here. Click here to learn more about PEDS and read more about Thursday night’s awards ceremony. Congratulations again to two VaHi residents who are making a difference in the walkability of our neighborhood and the city of Atlanta! This entry was posted in news and tagged 2013, peds, peggyberg, randyguensler by John Becker. Bookmark the permalink.